I kind of agree with the video. I do wish they just had more content. They could have gone all out and made it like 500 pages and it would be great. However, it's a quality art book. Lots of different concepts and spreads. The binding, pages, and cover solid quality. If you're a fan of the movie it's a must buy. Got the Breath of the Wild art book for Christmas, I will now lament our loss of poncho Revali. Also a Fullmetal Alchemist one but like most manga art books it's more a compilation of volume covers and promotional art. Has anyone checked out the various console anthology books from Geeks Line? I just saw the Gamcube one on Amazon and am thinking of picking it up. I have the Playstation one and it's a great book. The GameCube one looks even better because it has every game listed on it. Yeah, I already find the first part more interesting than the game list but it all seems really well put together so I'm going to check it out. I just hope that if I like it the N64 version gets a reprint. 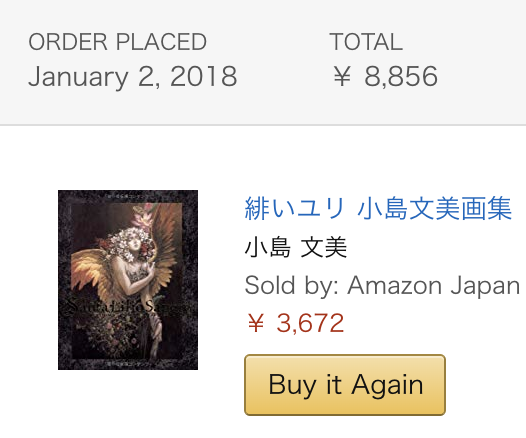 I have always dreamed of buying Ayami Kojima's most beautiful work: Santa Lilio Sangre. Never judge an item's value based on amazon listings. Sure, someone might be willing to pay that, but past ebay sales have been between $100-$150. That's still a lot, but way less than those amazon prices. Got myself DMC, TW3, Persona 3 & 5, Bloodborne artbooks this year. Haven't opened a single one of them (hah). Thinking of getting the Final Fantasy and MGS ones next year. Makes me wonder what kind of rendering tech and hardware we'd need to render some of these thoroughly nuanced and artistic renditions 1:1. Wow, I think I paid $50-$60 for my copy. Check Yahoo Auctions, they still pop up on there for that price on occasion. Dark Horse has a relationship with Konami. I wonder why no one's bothered selling this book internationally considering their previous Metal Gear books. I thought that didn't come out until March. Did Amazon lie to me? This is my only one from them, but now you've made me wish I ordered more :). My copy of Gamecube anthology arrived last night and I looked through it a bit and am pretty happy with it. While I do like the first part more than the games section, there is something cool about having a complete cataloging of all Gamecube games. I really dig the sections covering things like the demos and test station games and the various peripherals released. Now I just hope the N64 book gets a reprint and that they put more of them up on Amazon. What a great cover. My god! I was looking to grab a cool DQ art book, since I have an eBay gift card left over from Christmas. Any recommendations? I'm not terribly interested in that recent Viz release, since I tend to prefer Japanese paper quality. Anyone own the 25th Anniversary Art of Mana? It's been on my to-get list for the better part of the year, so I used today's 15% Popup coupon on eBay to snag a copy for $42.00. Think it's worth the purchase? FYI to anyone who has not yet gotten "The Sky" yet, I just noticed it is going for $27.96 on amazon (US) right now. I was just randomly browsing my wishlist not actually planning to buy anything, but this price feels criminal and now I have to pull the trigger on this one. E: Scratch that, it's a 3rd party seller with like 22 bucks shipping. The best one I ever saw was this rare anime figure a 3rd party seller had listed for a reasonable price....and then $800 shipping. Art direction and music are easily the best parts of Remember Me. The latest artbooks I have are The Art of Metal Gear Solid I-IV and FFU books (I only have the first two volumes currently. The third one is being released later this year) -- I yet have to pick up Bayonetta 2. Darn it, I need to get on that! Not into these kinds of books at all, really, but I got the BotW Creating a Champion book and I thought it was pretty swell. Some interesting stuff that fills in some of the story - which all takes places 100 years before the time of the game. 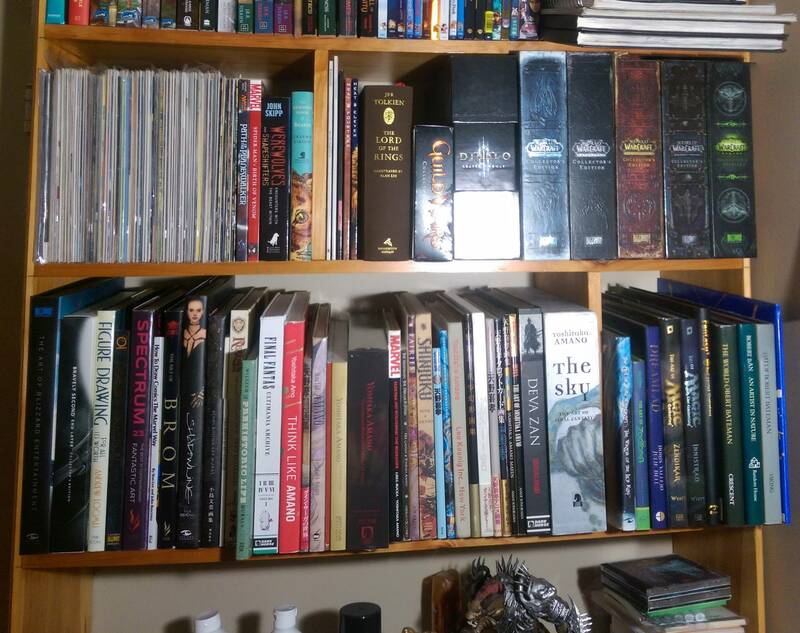 Finally got around to around to organizing my video game/Japanese art collection: Warcraft books are in the collector's edition thanks to lack of space. What is the big scary Shinjuku book ? Haha, just a little. I'm on the lookout for an original but they're almost never in color at my budget. 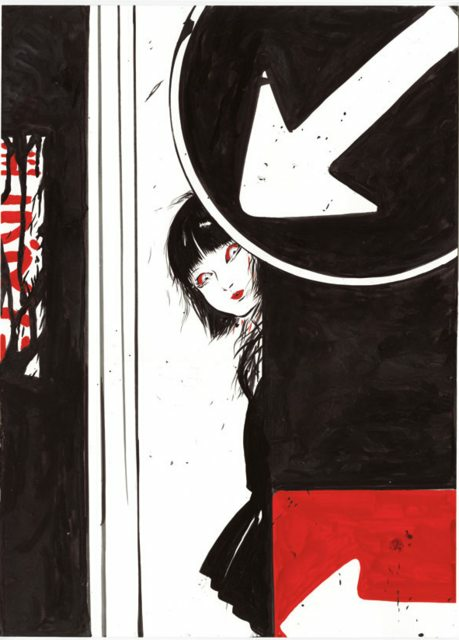 Shinjuku is an illustrated short thriller written by a guy called Christopher Morrison. The artwork is done predominately in black and red. "FINAL FANTAS". The typo sticks out :x Looks like it might be a misprint, just checked my copy and it includes the Y. In my defense, everything pre-Warlords was bought secondhand. And I don't have the latest one because they got rid of the the artbook and soundtrack CD. Nope, just a Photoshop snafu it seems. I had to double check when I got home. Hey UnluckyKate i just went back and looked at your FF post a couple pages back. I actually have been getting back into XIV and I wanna get the books. Do you have all of them? Or just the stormblood one? It looks like there are four?? I have none lol I just gift them to a friend that is fan of the game and too broke to buy the books so I sneak in after he opens them to enjoy them. Plus 2 lore books (that are amazing and must haves if you enjoy FF XIV story and universe): Encyclopedia Eorzea volume 1 and 2. Ahhh, that makes sense. I'll leave the lore ones for later. As of right now, the lore is unimpressive to say the least, but only up to when you join grand companies in the MSQ so not far in the game at all, and nowhere near HW/SB, which i understand get better MSQ/Lore-wise. A cursory search suggests that you either buy through the Squeenix store or import, as it looks like Amazon doesn't sell them directly? They're $40/ea there, and that looks to be the cheapest anywhere (new, anyway). Does that sound right? E: Also you are a very generous gift giver! Yeah, the Square store is the easier option even if it has rather high shipping fees... Other shop will mark up the prices of the books to compensate. Went ahead and picked up the book. It's a very nice and comprehensive collection of all the Mana games thus far, collecting what looks like most of the finalized art pieces available. Made me remember how much I dig the gorgeous, pastel fantasy colors of this series, and the all-new 25th Anniversary specific art pieces are worth the price of admission alone. Probably my only complaint is that, at just 207 pages, some of the sections are heavily condensed by fitting too many character images onto single pages. Seiken 4/Dawn of Mana, in particular, crams 2-3 characters and their numerous designs onto one page each, and it comes off looking extremely cramped. It's difficult to fully appreciate the art work in such a tiny, pared down state, and the book could have benefited from extra breathing room if they'd added another ten pages or so. Thanks for this, I've had my eye on it for a while but there's barely any information or shots out there! I would have inevitably picked up anyway but nice to hear some generally positive impressions. It's an admirable compilation. It delivers as far as having most of the crucial art pieces under one roof (it doesn't contain much in the way of weapons/item designs and the like), but again, I just wish some of the character pieces had more pages devoted to themselves. 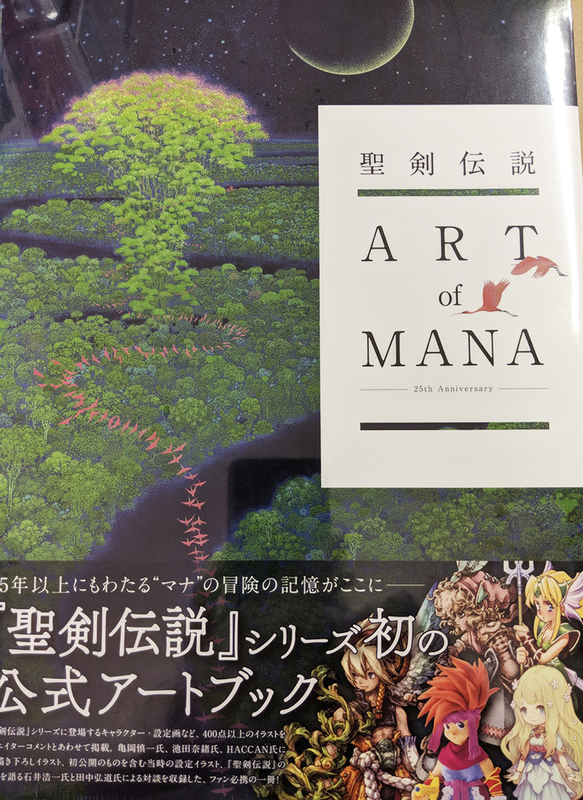 I don't own it myself, but there was a separate art book released that covers both Seiken 4/Dawn of Mana and Children of Mana -- which are the titles most affected by the truncated format in the 25th Anniversary book. After seeing what it looks like by way of Parka Blogs' site, I'm halfway convinced I need to pick this one up as well. Otaku.com has some choice pics of the 25th Anniversary book, but if you're interested in seeing more, hit me up and I can share a few more shots. I researched the first ffxiv art book (since it's the only one I can't get on Squeenix store) and i'm unclear on whether the Japanese and North American versions of the book are different? 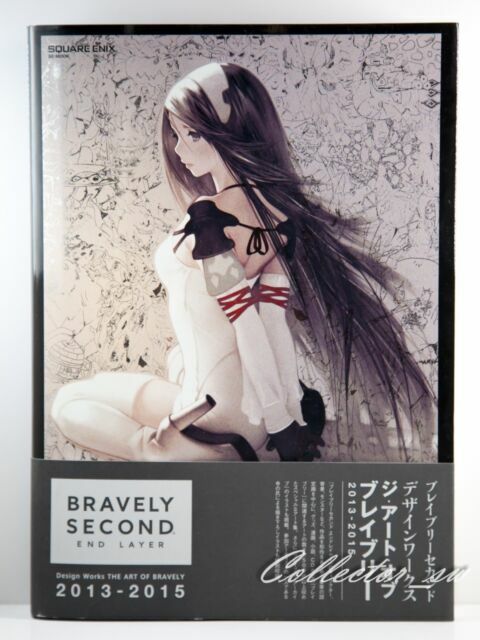 One of the notes on the squeenix store listing says "* This is the North American version of the art book released simultaneously in Japan and Europe. It is not an imported item of the Japanese or European versions. " which would lead me to believe it's different? The first pic below is the squeenix store version (north american release?). The second is what i believe is the imported/japanese version. 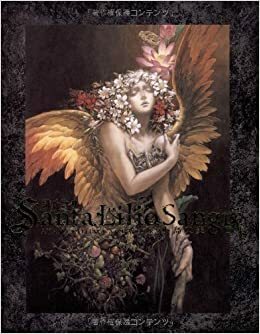 The confusing part is when i look at pictures of the inside, regardless of version or place I look (amazon, ebay etc), it seems that some of the book is in Japanese but some of it has English translation next to the Japanese. It seems this is the case regardless of version? Ultimately I'm just trying to understand if I need to get the North American release version because it has "more" English, or if it's the same between the two and it is literally just a different cover for the NA release. 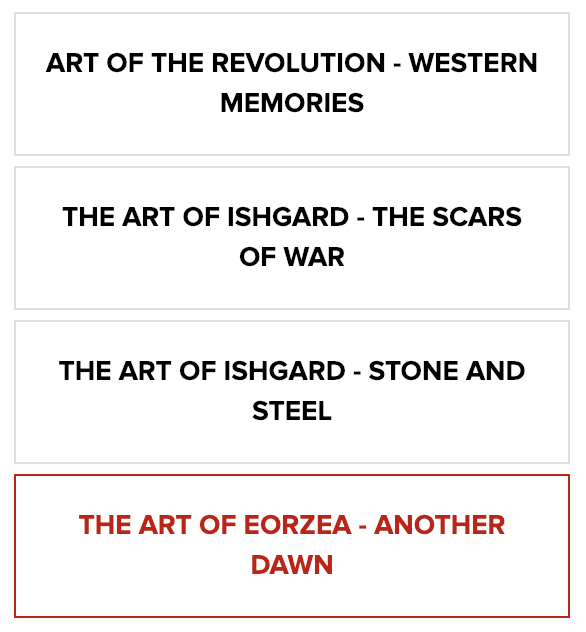 In case of the first Artbook, I think its the same. I got all my artbooks from Japanese websites and the first 2 has both English and Japanese commentary under the artworks. Hum... I don't remember much. I bought this one in Japan for my friend but I don't remember much. The only major factor would be if there was an interview that would probably be in English and thus a reason to get the NA. I can't really help you right im in between two flights with spotty wifi. Okay thanks both of you; I think i'm just gonna grab one that seems like a reasonable price. Thank you! Just curious, but how much of the book is Seiken Densetsu 2 & 3? The whole series has beautiful art so I always figured the book wouldn't disappoint, but 2 and 3 are the only games I really played/care about. I'm assuming it's the same content but localised, but wanted to know if someone here knew definitively ? That's right. 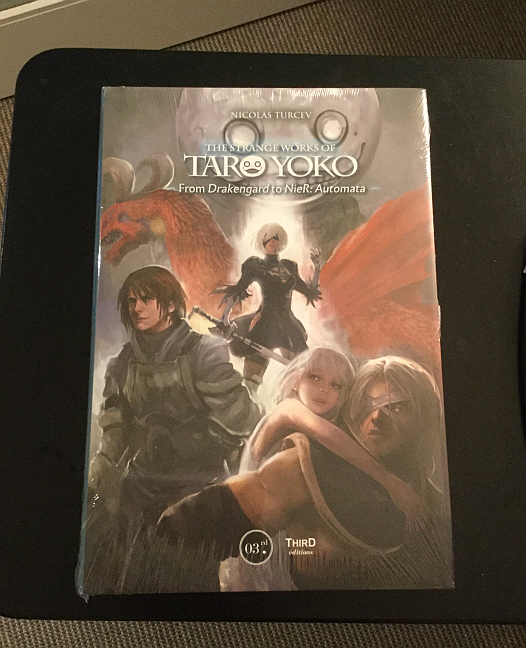 The content is the same but the collector's edition version just has a few sketches removed from the Japanese one, though can't remember off the top of my head what exactly.